Running and training for a marathon is hard. Running and training for a marathon with type 1 diabetes? That’s extra hard! Running and training for a marathon is hard. Running and training for a marathon with type 1 diabetes? That’s extra hard! But I’ve done it now … twice! 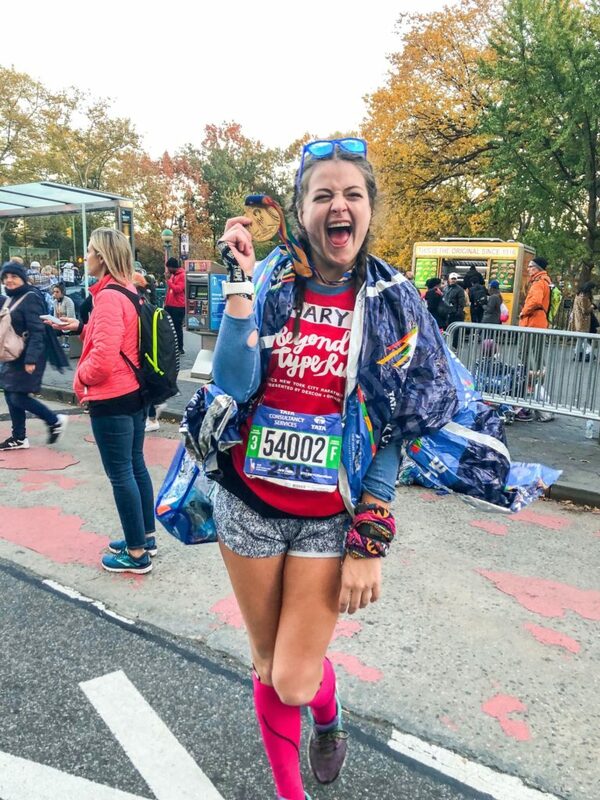 I just completed the TCS New York City Marathon for the second time, something I never would have believed possible. 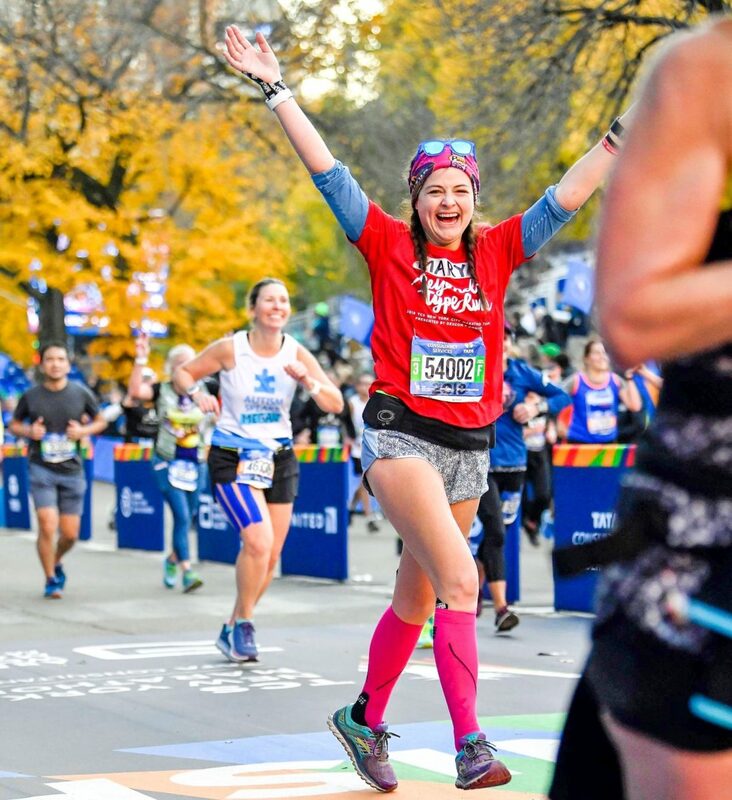 I was diagnosed with type 1 diabetes in first grade at age 7, and I was not a runner growing up – in fact, I hated running! 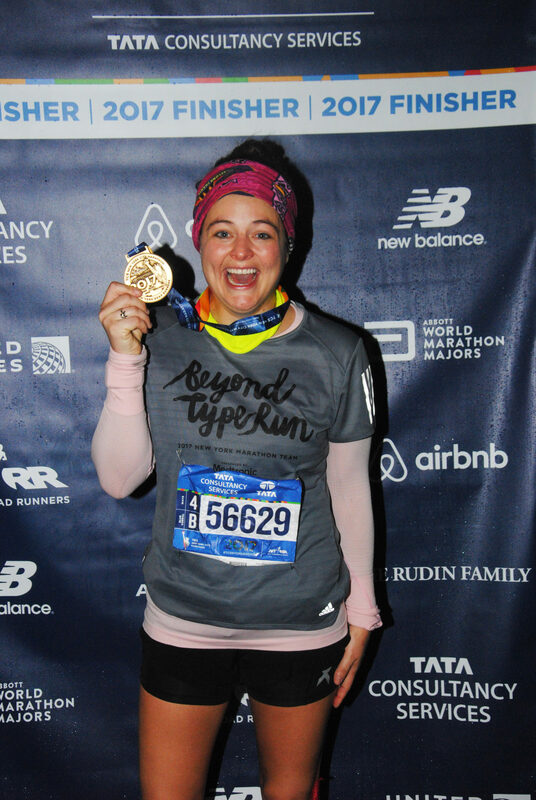 Fast forward to February of 2017: I decided to run the New York City Marathon with Beyond Type 1. Once I decided this I had a monumental task ahead of me: learn how to run and train for a marathon and still manage my diabetes. Woah. I started slowly. Walking slow. I began by doing a 5k run-walk-run program. I was a beginner runner, so I couldn’t jump right into a marathon training plan, which required you to be running at least 4 miles per run. I couldn’t even run one! I diligently and slowly worked my way up to where I ran my first mile in April 2017. As I increased my mileage, I learned to identify blood glucose (BG) patterns through my Dexcom CGM. The adrenaline “liver dump” BG spike happens if I’m running a faster pace or get excited and nervous right before a race. My CGM is how I learned to fuel for long runs. I saw that I would start trending lower around mile 4, then again at 8, 12, 16 and based upon that I came up with a plan of what to eat when, when to give insulin and when not to. My CGM has been the most useful tool in my training, hands down. Mental tools are another big one. Your mind is just as important as your body in running and keeping yourself motivated is essential. During the 2017 marathon, by Mile 20 I had convinced myself I couldn’t do it. It had been pouring rain for 4 hours. My pump site had fallen out 7 miles earlier, leaving me around 200 mg/dL. I was weak, dehydrated, soaking wet and miserable. My brain told me to give up. But somehow, I found the will to continue on and finish the marathon in 6 hours, 14 minutes. 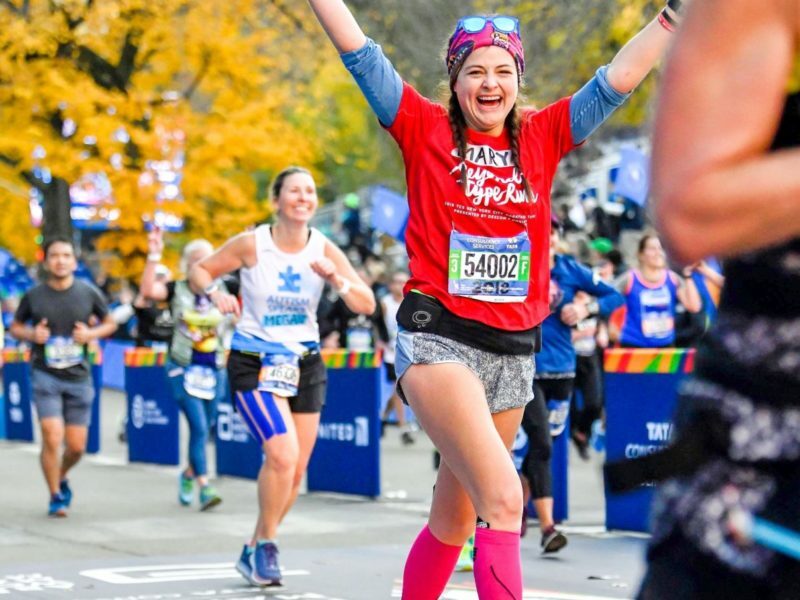 Mentally, training for my second marathon was so much harder than my first. Harder to motivate myself, harder to believe in myself, I was harder on myself and all the runs seemed harder. I couldn’t get out of my own head for so long. I was terrified of not being able to finish and worried I wasn’t up to speed with training and that anxiety really affected how I trained because I freaked out a bit! I was able to work through many of those mental blocks, so I could continue running and loving it, without all the stress and pressure I put on myself. All the painful hill training, the mental roadblocks, the diabetes rollercoasters had all been worth it. It also helps to have something to run for that is bigger than me as well. When I run, I’m not just running for me – I’m running for the diabetes community! 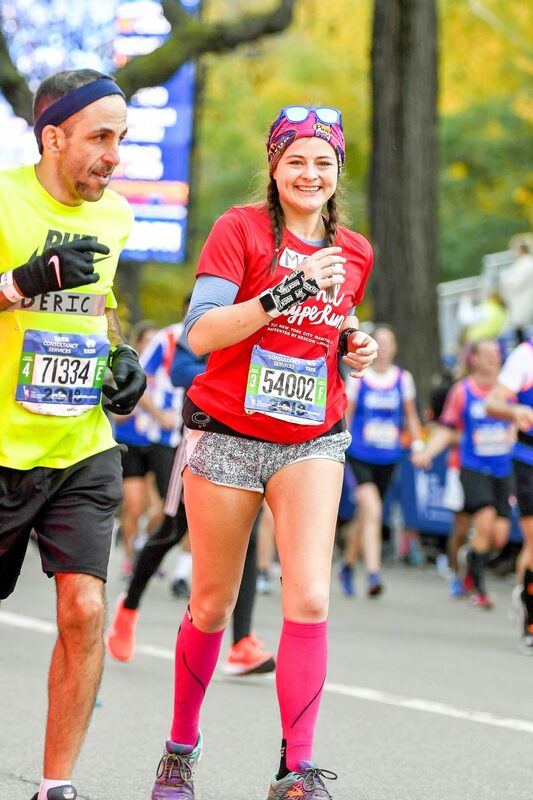 While training for the 2018 New York City Marathon was mentally harder, the race itself was amazing! The morning of the race my nerves finally gave way to exhilaration –but not before shooting my BG up to 300 mg/dL before starting! I ran through New York with a new excitement and vigor. I was running fast! I saw the cheering sections for our Beyond Type 1 team, my boyfriend, friends + family at miles 8, 17, and 24. Each time was a new burst of energy, and a chance to stock up on Gatorade. I drank Gatorade with water, and ate gels and chews to fuel myself and keep my BG levels steady. I didn’t have quite enough sugar and was trending down – I was set to finish the race around 70, too low for comfort. I chugged a bottle of Gatorade at mile 24 and raced to the finish line. I cried as I crossed the finish line at 5:17 – 57 minutes faster than last year!!! All the painful hill training, the mental roadblocks, the diabetes rollercoasters, both in 2017 and 2018, had all been worth it. After I crossed the finish line, I looked down at my watch and saw a perfect BG of 100 – a unicorn* for my finish. It was so fitting. *A “unicorn” in diabetes slang is a BG result of 100 mg/dL or 5.5 mmol/L. 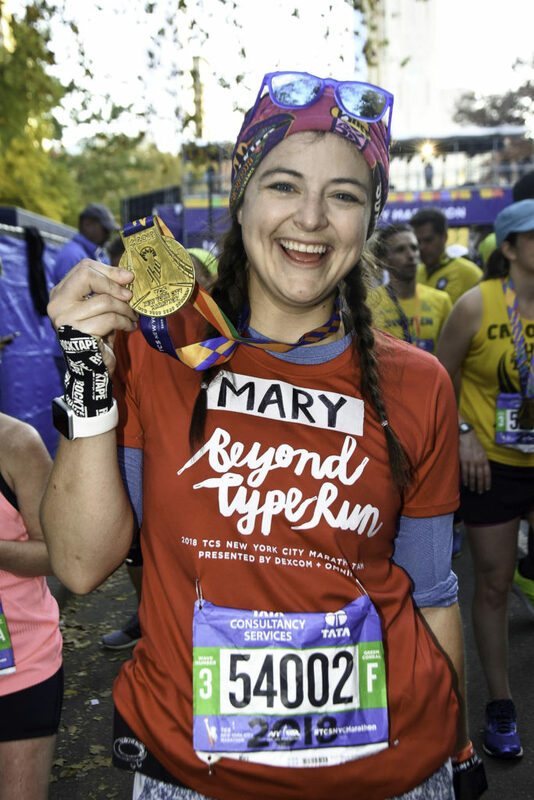 Mary Lucas is head of Influencer Engagement at Beyond Type 1 and was diagnosed with type 1 in 1998 at the age of seven. She attended Parsons the New School for Design in New York where she studied fashion design with a focus in childrenswear. She is passionate about living well with T1D, finding a cure, and growing Beyond Type 1. Find Mary and her French Bulldog Lola on Instagram @MaryAlessandraa. 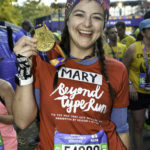 In her role leading Influencer Engagement, Mary connects Beyond Type 1 ambassadors to a wide variety of programs and efforts.